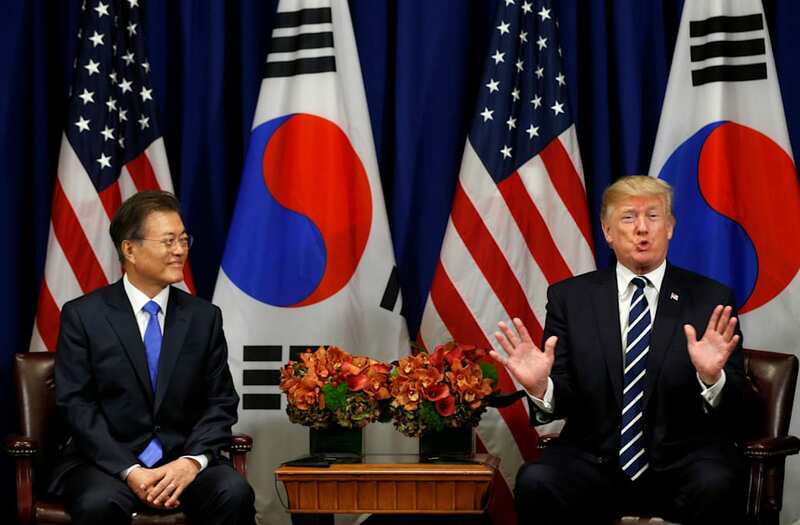 President Donald Trump participated in a bilateral meeting with South Korean President Moon Jae-in on Thursday, and took the opportunity to crack a joke when Jae-in used a particularly charged word. In condemning North Korea's continued moves to build up their nuclear arsenal, South Korea's leader described Kim Jong Un's actions as "deplorable" -- an adjective that had historic relevance in the 2016 election. "I'm happy you used the world 'deplorable,'" Trump said upon hearing it. "I was very interested in that word. According to White House press pool reports, the U.S. president also added to his color commentary, adding that "deplorable" is "a very lucky word for [Trump] and many millions of people." Former Democratic presidential nominee Hillary Clinton famously emboldened Trump and his base last September when she said "half" of supporters for the then-GOP nominee belonged in a "basket of deplorables." Although she at the time noted that she was being "grossly generalistic," the comment quickly became a unifying message for Trump, who was able to slam Clinton as elite and out of touch by using her own words against her.